At 2.38 pm: the female leaves the nest at the last moment before the eagle attacks. In nature such events remain unseen by humans. The web camera allows us to get to know a little more about the realities of forest life. The adult WTE acted as “ruler” in the black stork nest, slowly, checking the surroundings, and quite foolishly. The WTE seemed to have a “plan” to carry the egg in its beak, whole, to his family. With this foolish enterprise the WTE broke two black stork eggs, to no use. Stork eggs are about the size of goose eggs and also the eggs of eagles, weighing about 140 grams. A hungry bird would have crushed the eggs and eaten them without leaving the spot. The fate of the second egg. 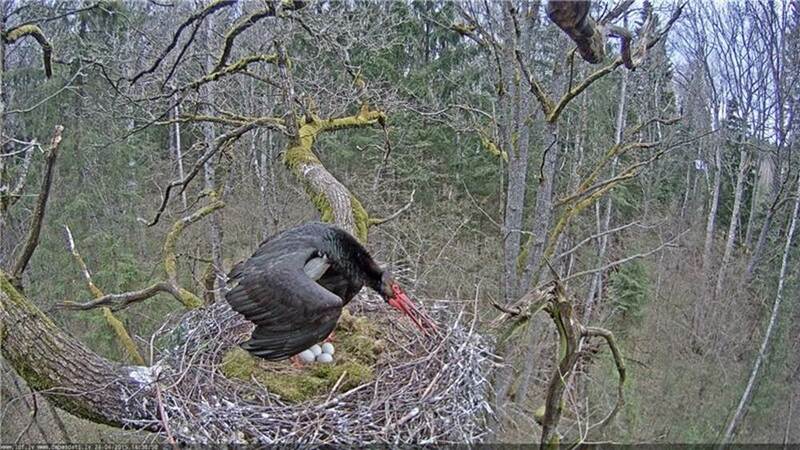 Hopefully the failures will not bring the eagle back to the stork nest. The agitated female arrived at the nest as the first after the departure of the eagle. When the male arrived and settled down to incubate the eggs the female could leave.